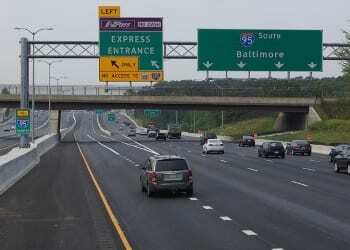 BALTIMORE, MD – The Hogan Administration announced on Friday the investment of an additional $890 million to extend the northbound I-95 Express Toll Lanes (ETL). The expanded $1.1 billion project will now provide two ETLs for more than 10 miles from north of MD 43 in Baltimore County to north of MD 24 in Harford County. Governor Larry Hogan initially announced the ETL northbound extension project in December 2017 as part of his Baltimore Traffic Relief Plan. The Maryland Transportation Authority (MDTA) will begin the expanded $1.1 billion project in early 2019. “The I-95 ETLs north of Baltimore have been very successful, and I’m pleased we are able to deliver even more traffic relief,” said Maryland Department of Transportation Secretary and MDTA Chairman Pete K. Rahn. The I-95 interchanges at MD 152 and MD 24 also will be reconstructed to provide access from the northbound ETL. Reconstruction of the MD 152 interchange includes associated park-and-ride. Reconstruction of the MD 24 interchange includes a two-lane flyover ramp toward Bel Air, alleviating congestion for motorists exiting I-95 to MD 24 and MD 924. “Adding two express toll lanes in the northbound direction will provide better service for our customers, reduce congestion and crashes, improve safety and allow for better incident management and maintenance activities,” said MDTA Executive Director Kevin C. Reigrut. As part of the project, there will be significant bridge improvements, such as the reconstruction of the Raphel Road, Bradshaw Road, Old Joppa Road and Clayton Road overpasses to accommodate the larger area needed for the ETLs. Additionally, the I-95 northbound bridges over the Big Gunpowder Falls, Little Gunpowder Falls and Winters Run will be widened and improved. Delivering on the community’s requests during the project planning process, MDTA will place five new noise walls along the corridor on both sides of I-95. The original $210 million project was slated to provide a 7.75 mile, single-lane extension from north of MD 43 to MD 24. Public meetings were held in February 2018.